EMI management is a must for OEMs manufacturing electronic devices or equipment containing electronics. EMI gaskets made from rubber material such as silicone and fluorosilicone lose some physical strength due to the conductive particle fill. This is most apparent in tensile strength in thin EMI gasket materials. To address this, Stockwell Elastomerics now offers components manufactured from SNE-556-R conductive silicone EMI gasket material with a conductive reinforcement. SNE-556-R is 65 durometer (Shore “A”) with volume resistivity that challenges high cost silver coated aluminum filled products, but at a fraction of the cost. 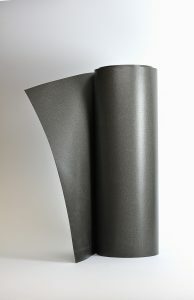 Additionally, it is manufactured in continuous sheet rolls allowing for manufacturing large EMI gaskets. The reinforcement enhances the conductivity of the rubber as well as giving dimensional stability to cut parts. An example is an EMI enclosure with many bolts – the reinforcement prevents the gasket from stretching during installation ensuring holes in the EMI gasket align well with the fastener hole in the enclosure. 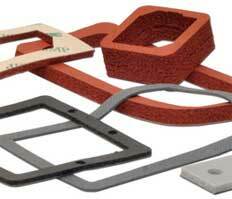 Stockwell Elastomerics manufactures EMI gaskets and EMI shielding components for the technology and defense sectors. Products include: molded EMI components for medical device, waterjet EMI gaskets for defense and aerospace, EMI connector gaskets and EMI card cage gaskets for a multitude of industries. For more information on SNE-556-R reinforced EMI gasket material and other silicone gaskets, please call 215-335-3005 or complete a contact form for assistance.